It all starts with the smartest data and superior list analysis. Central File offers you a complete turn-key solution, all under one roof. Our key team members have a combined 116 years in the Rent-To-Own industry. We understand both the advantages and the challenges it presents. Central File provides complete direct mail marketing solutions for your rent-to-own business. We are a complete direct mail provider, with in-house marketing specialists. Central File boasts a state-of-the-art security system. We exceed the security standards of any other full service direct mail marketing company. Our extraordinary measures meet Department of Defense standards, protecting all information. Our team of marketing professionals will ensure your campaign is successful and show solid proof of what is working. Central File produces tangible results. Central File specializes in providing customers with a complete direct mail marketing solution. We do everything in-house, streamlining the production process and eliminating the need to outsource any part of the campaign development, making it easier for you. Central File Marketing has a talented team of marketing designers, target market researchers and direct mail specialists with insider knowledge of the rent-to-own industry. Our state-of-the-art security measures ensure your sensitive information is highly protected. Central File Marketing consistently goes above and beyond to make certain your direct mail marketing campaign leads to continued success. Unlike other direct mail marketing companies, Central File provides measurable ROI results. With our unique TracBac system, exclusive to Central File, your return on investment is measured and reported back to you for each store. Our marketing programs are centered on our client’s continued growth and TracBac is an integral part of measuring client success. Our TracBac system measures your return on investment not by how many pieces were mailed, but by how much you spent per new delivery. We work with you to develop a comprehensive, customized marketing plan, which will result in higher customer retention rates. Begin tracking your marketing dollars in terms of cost per delivery. Central File has the most advanced security system in the rent-to-own marketing industry. Central File Marketing consistently goes beyond industry standards, ensuring your information is protected. Your customer data is only as secure as the vendor you choose to share it with. With years of industry experience, we understand every aspect of the rent-to-own industry and the unique challenges of targeting rent-to-own prospects. Utilizing Central File’s exclusive direct mail approach offers a great advantage over other direct mail services for customer retention and growth. Central File’s approach leads to successful deliveries and loyal customers. We work with you through the entire direct mail marketing process, ensuring your custom designed mailers yield high response rates. Central File Marketing uses a proprietary mail marketing formula, which leads to more successful conversion rates, happy renters and increased profits. 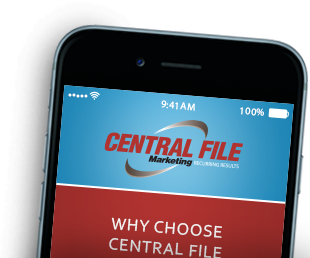 Central File Marketing offers customers convenient, all-inclusive turnkey services. Our exceptional team will create and implement an effective direct mail campaign, which will deliver high customer conversion results. 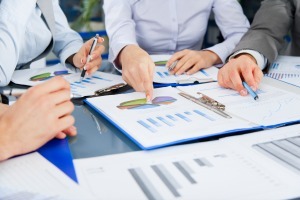 Our market researchers will provide you with an in-depth analysis of your target audience. We also offer a wide range of cost effective, in-house printing options, so you get the most value for your marketing dollars. 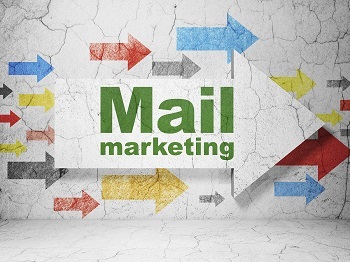 We have streamlined the direct mail marketing process. Everything is done in-house by our team of marketing professionals and graphic designers. From initial design of a marketing campaign through tracking your ROI, Central File Marketing provides your business with the complete package. We deliver the best precision mailing services all under one roof. Start or enhance your direct mail marketing campaign and watch your business grow. Central File’s approach leads to successful deliveries and loyal customers.